This review first appeared in the January 3, 1998 edition of the American Reporter. Cannonball Records, the new blues label out of Minnesota, has quickly done what any label needs to do before it can succeed: Sign a major star. 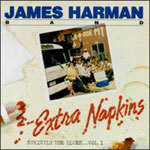 In the case of Cannonball, that star is blues harmonica veteran James Harman  the upstart label has reissued a 1988 Harman album from independent Rivera Records. When this album was recorded, Harman was still unknown to all but the most loyal blues fans or those lucky enough to have seen him live. This release shows that if Harman had yet to arrive commercially, he had no such lack in the artistic realm. Along with Southern California compatriot Rod Piazza, Harman is one of the leading lights of SoCal beach blues  a sun-drenched, sand-caked variation of the music that is more rock-oriented than purer forms while still swinging as much as any blues. This album  perhaps because Harman had complete control over the final package  has a harder edge to it than his more recent outings. Of course, his band of the time was blessed by Kid Ramos and the late Hollywood Fats on guitar. That kind of muscle can't be replaced. But Harman's own playing here seems more focused than more recent, more accessible releases. It's as if he were trying to force his way into the top echelon of the blues world by pure effort  and maybe it worked. For Harman is now one of the best-known blues artists, especially out West, and his rise started soon after this album was originally released on Rivera. This CD being titled Vol. I, we can only hope that some of Harman's other Rivera LP releases will soon see the light of CD day on Cannonball.